"A light pasta salad both adults and kids will love. This is my own creation I am sure many have already tried. You can add or take away from this recipe. I usually serve crowds of 10 to 20 people, but I love to entertain so I also always serve this, spinach dip, potato and green salad, chip with dip and wings... This dish is always a hit!" Bring a large pot of lightly salted water to a boil. Cook the bow-tie pasta at a boil, stirring occasionally, until cooked through yet firm to the bite, about 12 minutes; drain and cool. 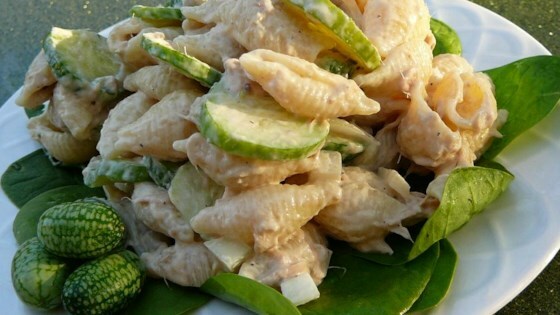 Mix tuna and cucumber together in a salad bowl; stir in cooked bow-tie pasta and ranch dressing. Chill at least 1 hour. I prefer to make this the night before. If you do not have time I suggest letting it sit for a few hours before serving. You can chicken or ham, just cut it into small bite-sized pieces. This was a could recipe I substituted the cucumber with peas.